More than half (52 percent) of respondents identified tracking obligations, deliverables and key events as their biggest contract management challenge. Approval, Workflow and Redlining were the next, most significant problems down the list. The survey respondents also indicated an overwhelming response when asked about the impact of human error on the contract process; 75 percent said human error affects their contract management process often or very often. But with the rise of tools like AI and advancements in automation, nearly all are hopeful opportunities for human error will eventually be eliminated. Ninety-seven percent of respondents see AI as having the potential to reduce human error, expedite the contract approval process or both. "SpringCM's mission is to help work flow, and this annual report provides important insights that help us accomplish that goal," said Will Wiegler, senior vice president and CMO of SpringCM. "Through a deep understanding of businesses' contract challenges, we've been able to build solutions that best meet their needs." Another significant finding from the report is 44 percent of respondents – to last year's 31 percent – use a Contract Lifecycle Management (CLM) solution to manage contracts. To meet the needs of today's business world, companies need a solution to improve and streamline contract process, which is why every year more organizations are seeking automated solutions. "Last year, only 27 percent of respondents said their contract process took less than a month, and this year, about 45 percent say it takes anywhere from 2-3 weeks," added Wiegler. "It's no coincidence that many more businesses are using a contract management tool this year and the process has sped up immensely." Each year, SpringCM sets out to identify the top contract management challenges facing businesses. 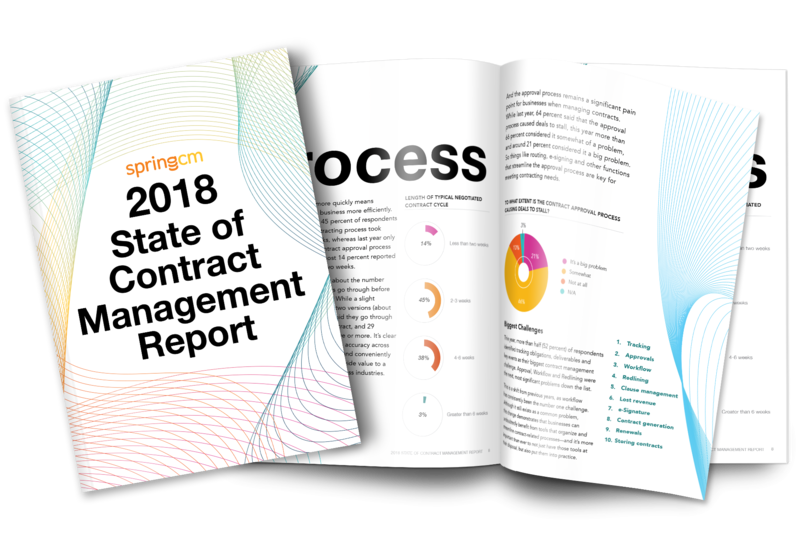 Its State of Contract Management report captured feedback from 1,891 individuals to create its 2018 report, nearly double the number of respondents from two years ago. If you're interested in reading the full report, please visit https://www.springcm.com/2018socm.